I started the week with a very pleasant lunch on Monday – it always somehow feels particularly indulgent to be having good food and maybe even a glass of wine on a Monday! I was with Layisha Laypang and Simon Lipscomb from procurement consulting firm Efficio. Simon joined recently from Proactis, the software provider, and he told me how (pleasantly) surprised he was to see quite how much effort Efficio is now putting into its own software development – more on that to come, I suspect. The firm’s consulting business also appears to be going from strength to strength. It was only in October we reported that Alex Kleiner, who led Coupa’s growth in Europe for some years, had joined “quote to cash” software provider Apttus, presumably with a view to helping the firm move more into the procurement and contract management space. Well, along with another senior ex-Coupa colleague, both have now left Apptus, which doesn’t sound like very good news for the firm, whatever the reasons. Kleiner is one of those people who is highly competent and respected in a business sense, but also is just an excellent person with whom to have a beer and a chat. Good taste in music too … so we wait with interest to see where he goes next. 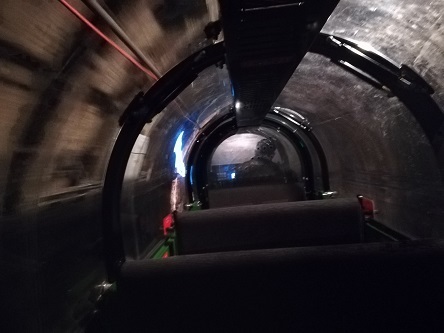 We’ll have more next week on the CIPS Fellows visit to the “Mail Rail”, the Royal Mail underground railway that for 80 years moved the post around under the streets of London. It was very interesting, and here is a picture that might give you an idea of our rather claustrophobic trip, taken from inside the tiny "carriage"! While we are talking CIPS, we were pleased to hear the Institute has decided that judges for the CIPS Supply Management Awards this year will agree not to enter their own organisations for the competition. That makes a lot of sense and positions those Awards as having the highest possible ethical standards and credibility, which is exactly where the world's leading procurement Institute should be! Good decision, people - and perhaps Procurement Leaders might do the same next year? Both Nancy and I are in Copenhagen for the first part of next week, attending the ProcureCon Indirect event. We’ll be reporting of course but if you are attending, do come and say “hello” and have a chat. Then the following week I will be at the Ariba LIVE event in Amsterdam, where I’m participating in an exciting panel discussion – more on that next week too! Ambulance, the last album from Swedish prog-ambient-psych rockers The Amazing is my absolute favourite for the iPod on flights when I want to fall asleep. That’s not an insult, the music isn’t boring but it has a calmness to it that I find pleasantly soporific. The new album In Transit is out now and at first listen, seems to have similar qualities. Here is “Rewind” from it which gives you a pretty typical sample of their work.